Drafting Steals: What Is A French Curve? The French curve comes in many styles. The normal style of this curve is a drafting template which is made out of several different materials. 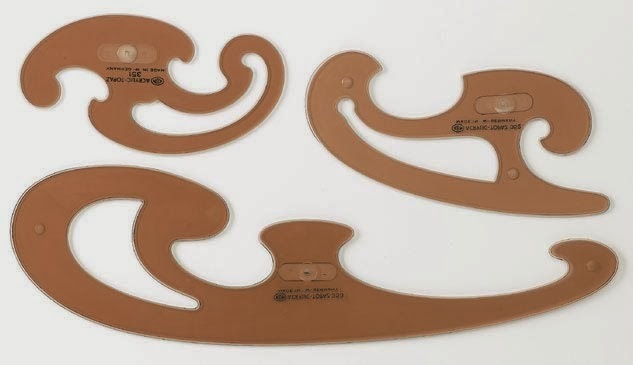 The materials that normally compose a French Curve template will be metal, wood, or plastic. Regardless of the material it is made of, this particular type of template will be composed of many different types of curves. This type of curve template is normally employed during the course of routine manual drafting. When the French style is employed, it is possible to draw very smooth curves, very close together or as far apart as needed. The radii of each curve can vary as needed. The shapes created by this particular curve will fall under the heading of separate segments of the Euler spiral. Some may know this spiral under the name of "Clothoid" curve. In order to create this special type of curve, the draftsman will first place the template onto the drawing material. After doing so, he or she will then trace around the curves with a pencil, knife, or special curve template instrument of their choice. The operation will be repeated until the desired result is achieved. The French style of curve has many different shapes, sizes, and permutations. One of the most famous and frequently employed styles is the Burmester set. There are several different styles that the Burmester set breaks down into. Each is useful for creating different shapes. For example, one particular set of Burmester may be used to create to create elliptical curves, while a second will be used to make large hyperbolas. A third set of Burmester is frequently used in order to create very large parabolas. The French style of curve will very often be employed by specialists such as architects, mechanical engineers, and shipbuilders. Burmester and other sets of curve templates are commonly found in the workshops of such highly specialized employees. In modern times, the French style of curve is largely recreated using 21st century digital technology. For example, computer aided drafting (CAD) systems are used to carry on this long and proud tradition, using modern technology to largely replace the old, purely analog Burmester and other templates. Using modern CAD systems with vector based graphic enables modern draftsmen to achieve the creation of a drawing that utilizes an extremely precise radius. Digital computer graphics are excellent tools for generating sets of coordinates which are employed in order to describe, with unfailing accuracy, the precise points of an arbitrarily determined curve. The points along this arbitrary curve can then be connected with line segments. In doing so, a curve is approximated using digital means, which describes a shape with incredible accuracy. Modern digital representation programs have, to a large degree, taken the place of old fashioned Burmester sets. And although CAD systems can meet the needs of many applications that were, in the not too distant past, the job of skilled draftspersons, the need still exists for hand drawn plans, designs and drawings. There exists a connection between the right side of the brain and an artist, drafter or architect’s hand holding a drawing instrument that it would likely still take a room full of hardware to duplicate. Remember the showdown between IBM’s “Watson” vs. Ken Jennings on "Jeopardy"? It took a room full of IBM’s best machines and minds to beat one human brain, and that contest was about hard facts; creativity did not enter into the match. Perhaps a modern day Leonardo would be sitting at his laptop, designing things that had never even been dreamed of before. But perhaps not.